As someone who was born and raised in Oakland and finally just moved out at the age of 35, I can say that you do not really want to move to Oakland. Trust me. Oakland has gone from a bleak economical black hole to a pricey destination hot spot over the last decade, but that does not mean it’s the place to be. I know, that doesn’t deter you. You’re the type that likes to live on the edge and be as “urban” as you can so you’re moving to Oakland from another city anyways. Might as well save money right? Keep reading and I’ll teach you how. Best Neighborhood To Move In Oakland? Before I go telling you all of the neighborhoods NOT to move to, it’s best I just tell you which neighborhoods you can move to. To be centrally located you should move anywhere near Lake Merritt, Temescal, Grand Ave, Claremont, Rockridge, Piedmont, Uptown or even Berkeley. If you don’t mind being further out, try the Oakland Hills, Montclair, Dimond District, Laurel, Glenview and I’m sure a few are escaping me. I guess just stay away from East Oakland. If you really must live in the ghetto then you should shoot for West Oakland because it is near downtown, BART(public transportation) and has far fewer murders than East Oakland at this point in time. Also more of your risky friends have already moved there paving the road for you with things like $15 Mac and Cheese and $18 Chicken and Waffles. West Oakland is basically nothing like the Wild West it used to be. That’s actually a whole nother article but let’s face it, you may think you’re cool, hip, trendy, risky and daring, but you will never belong in the Deep East flat lands. A lot of the existing neighbors do not want you there “gentrifying” their ghettos and they have been very vocal about it. They do not want your tech money, neighborhood improvements or anything. Moving to one of these neighborhoods will only make you a victim of robbery. Don’t sour face me! 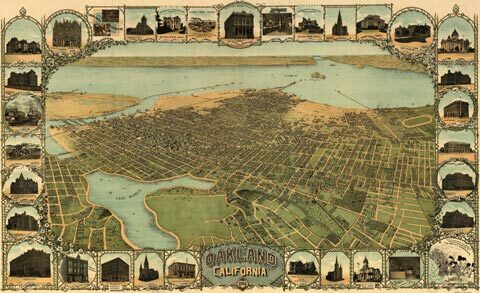 Oakland was in fact the robbery capitol of the nation 4 years in a row. This isn’t made up stuff. It’s been said that if you don’t know anyone that has been robbed at gun point in Oakland, then you don’t actually live there. Also what would you even do in the Deep East? There is no cool new place to eat, drink or even shop in Deep East Oakland. If you’re moving to Oakland for food, you may be let down once you do arrive in the town. Oakland has no real food hot spot other than maybe uptown area around Telegraph and Broadway. This area can be very over priced when it comes to eating out and your options are very limited. Problems of an old moneyless city suddenly getting new money over spilling from San Francisco. All the new stuff is three times what it should cost. Well, update, in the ONE year that I’ve been gone rent has skyrocketed even more but also a ton of new weird hipster food places have opened up. I hope you’re into paying $15 for small portions in crowded places where you must share tables with strangers. Cheapest Way To Move To Oakland Long Distance? If you’re just going to do it anyways, despite my warnings then this is the best way to move and save money. I myself moved out of Oakland to a much better city recently and I am quite the investigative shopper. This means I read hundreds of reviews, called multiple places, got quotes first hand and looked into the BBB reviews on these companies. Why? Because long ago, about 10 years ago I worked for a long distance moving company in a warehouse in Oakland and it was my job to respond to customer service inquiries. The company which I am unable to name would basically hold peoples stuff hostage when they refused to pay absurd hidden fees. The free moving quotes were very loose and deceiving by design. If you get a moving quote for a 2 bedroom they may not see it how you do and start charging you extra for the kitchen, living room, etc. And never have them pack for you unless you have money to burn because the boxes, blankets and plastic wrap are highly over priced and they will use the packing supplies obsessively. Another problem with these moving companies is some of them don’t actually own moving trucks. They search for another trucking company willing to haul your load for a low price and they take the middle cut doing none of the actual moving. So that can delay your shipment. They may say they have it all set up, but the truth is that they do not even own a moving truck. The other reason I did all the current research is so that I can write this helpful article for you. It’s what I do, so you’re welcome. So after a lot of research, I found that moving long distance with Pods is the best way. But there are a few tricks to save even more money. I personally found the best price with u-Pack and I learned a thing or two about current quotes by calling all of the long distance mover companies. No, they are not paying me for this article and likely do not know about it. It just happened to be the best way to save money if you know how to get around their tricks. Never go with the first quote. When you’re calling them make sure you tell them that this is your first call(even if it’ not) and that you plan on calling a lot of other moving companies to get the lowest quote. This puts the pressure on them to give you a lower price on your move from the get go. Tell them that you’re not sure a single Pod will do and you heard you can buy square footage in a trailer. It will work out better and cheaper in the long run. After they give you this lower price say “ok thanks, if I find something better I won’t be calling back so please do not contact me if you don’t hear from me”. This again assures them that this could be the very last time they speak to you and to give you the best deal they can now. They may even place you on hold while they go “talk to their manager”, which isn’t true. Still, take that moving price and say thanks, I’ll call back if I don’t find a better deal. And do it, take that price and call around, see if you can get a better deal. Saving another $600 with u-Pack. No coupon needed, after you have the quote that you think is the lowest, you have the option to skip the Pod or trailer being delivered to your move from address and take your stuff straight to the shipping center where the Pod/trailer will ship out from. They are not going to tell you this or offer this over the phone because they make a lot of profit this way. So make sure you ask once you have that final low moving quote if you can skip the Pod delivery and take your stuff straight to the yard to save $300 on each end. For me, being in Oakland it was actually ABF Freight Lines off High St. ABF is the u-Pack Pod moving company. That’s right, you save $300 on each side of your move by NOT having the Pod delivered to your house or apartment. This way you also get to skip dealing with the City of Oakland and buying permits for having the POD sitting out front of your house on the city street. Safer! A POD with all of your valuables sitting on a street in Oakland is a criminals free cake fest. No lock is going to keep the bad guys out and Oakland is currently fighting through a really high crime spree. When you use the ABF U-Pack Pod truck yard, your stuff is safe and tucked away from the Oakland streets. You do all of your moving in and out of the Pod in their yard which is open and active 24 hours a day. Because you save $600 by dropping your stuff of and picking it up you have some extra cash. You will need to rent a U-hual or Budget truck for about $29 a day but that’s renting on saved money. Some people argue that moving to the Pod yard is like moving twice but in reality once you pack the Uhual, the second part moving stuff out of the Uhual into the Pod goes much quicker. And that first pack can be sloppy since you’re just going from your place to the u-Pack yard. It’s kind of like practice! What are you going to do with that $600+ savings? Besides spend $19 or $29 on a Uhual moving truck to get from your apartment / home to the moving Pod. With all of that saved money you could actually hire some guys to move the stuff for you and still be saving money in the end. At the Uhual in Oakland on 51st and International Blvd (East 14th), you will usually find guys standing around looking for work. I offered them $20 an hour but I’m sure you can get them for $15. These guys were fast hard workers and some even had handy tools such as hand carts, dollies and blankets. You can also call the Oakland Day Labor Collective but I think you gotta give them some notice. 1) Be a master at getting the quote. 2) Get trailer footage instead of 1 or 2 Pods. 3) When quote is finalized ask about skipping pod delivery to save another $600. 4) Take all that extra money and hire movers! For a long distance move, Uhual turns out to cost a lot more than a pod and you have to drive it yourself, tow your car and pay for a LOT of gas. The Pod truly is the cheapest way to move these days, especially if you use my tips to getting the best long distance moving quote. Mofo, I think we lost a local home-grown treasure when you left Oakland, alas. I still come back to visit family and friends but every time, I cringe and am glad to be free of the Bay all together. I did 2.5 years in Portland and it was a far greater city but wrote this mostly satire article on reasons NOT to move to Portland. You can imagine the anger I spark in people with that one. But hey, I try. And now live in the most ghetto hood ever in Las Vegas(I call it the Bandon Lands) and do love it except this terrible weather. We’re talking 105-117° for nearly 3 months straight. Winter was amazing though. Because there was none haha. Here’s what I’ve seen since I’ve moved to West Oakland (4 months ago) keep in mind I’m from Chicago and much like Oakland the grand cities of the Midwest have been decimated by the lack of manufacturing jobs. Oakland is wild, colorful, beautiful. The people of West Oakland are nice, humble, and after a few hellos and waves most are more curious than threatening, even the two drug dealers that post up on apposing corners every evening. I get the feeling of community mindedness. Maybe it is scary for some, but like I said I’m from Chicago. Half of that city looks like bombed out Beirut. I think people have to realize that no matter how they feel right now Oakland is in a land grab situation spurred by the tech boom of SF which really can’t last much longer. My advice is, if you move to Oakland for affordability, become apart of your neighborhood. Everyday I find the same homeless man on my way home from work and give him a PB&J, chips, and an apple. Imagine if all the newcomers took it upon themselves to help just one person. As for downtown Oakland on the weekends, it’s like a weird ghost town. Downtown, Broadway is bustling with workers Monday through Friday, mostly hoping on and off BART to go back to whatever city they actually live in. But come weekend, just ghetto downtown during the day. A lot more sketch when there isn’t hundreds of worker people around. Hey… What’s going on in 2016? Is Oakland homicide free this far? I work in Oakland on the weekends and like to avoid the hot areas. See? This is the kinda crap that made me move away from my home city of Oakland. I used to be so proud of my town but now it’s gotten too racist for me. I get these kinds of comments all of the time and usually just delete them but maybe I should start letting them through.